DON'T YOU FEEL WELL, SAM? 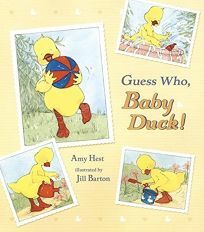 Baby Duck is a bit under the weather in Guess Who, Baby Duck!, the newest in the series by Amy Hest, illus. by Jill Barton. But when Grampa comes to visit with an album ""all filled up with pictures,"" Baby Duck soon feels much better. This comforting story may well inspire readers to look through their own baby albums.